Key FeaturesPunching dies for all types of ring wire, plastic comb, coil and calendars. Punch a wide range of mixed stocks. Fast die changes. 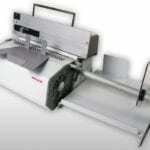 Fastest machine in its class with automatic paper ejection. Up to 3 times faster than a standard bench top machine. QSA (Quick Size Adjustment) for high flexibility of different paper formats. Vertical paper feeding for precise punching.